Up until its first controversial sale to developers in 2011, drama at the Chelsea Hotel was reserved to its longtime list of celebrity occupants. From being the site where Sid Vicious reportedly stabbed his girlfriend to death to where Dylan Thomas went into a coma just before dying to the home of Madonna in the ’80s, the landmark is more associated with NYC characters and culture than perhaps anywhere else. And now average New Yorkers will have the rare opportunity to own a piece of this history. 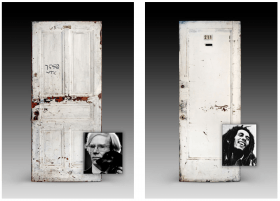 amNY reports that Guernsey’s auction house will be selling 55 original doors from the hotel, which, after “exhaustive research,” can be traced “to the iconic individuals who lived behind them,” including Andy Warhol and Edie Sedgwick, Jimi Hendrix, Bob Marley, Janis Joplin, Jack Kerouac, Humphrey Bogart, Thomas Wolfe, Jim Morrison, and Jackson Pollack.